Royal Persian Coinage. ca. 420 to 375 BC. Silver Siglos. Denomination : Silver siglos. Date : by Carradice to between 420 and 375 BC. 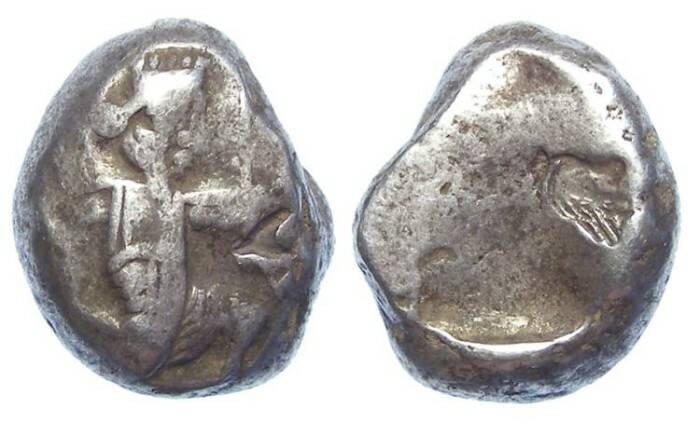 Reference : Sear Greek - 4680. Carradice IVB. Size : 12.1 x 15.2 mm. Weight : 5.56 grams. Grade : good Fine with a single small bankers stamp on the reverse. Obverse : Bearded Persian king running right holding a bow in front and holding a dagger behind. Reverse : Incuse rectangular punch.